Nos. 10 & 11 (the large double-fronted building on the left of the above photograph) has an eighteenth-century façade on a fifteenth-century building, and the top floor was added in 1883. It is Grade II listed (List Entry No. 1047312, where the present Nos. 10 & 11 are treated as one house, numbered as 10). At ground-floor level, the shop on the left (No. 10) was sacrificed in 1838 to afford an entrance to the newer section of the Covered Market opened up behind (Market Avenue 1)..
No. 12 on the right is also Grade II listed (List Entry No. 1116316, numbered as 11). Its ground floor is now just an entrance to the restaurant that occupies the basement of all three shops. Thus the only retail shop remaining here at ground-floor level is No. 11 in the middle. These three shops were in the parish of All Saints until that church was deconsecrated in 1971. This once stood on the site of 10–12 High Street. It was the headquarters of the Constitutional Club and this inscription (right) remembering both the tavern and the club is on the stairs inside No. 9, on the wall of No. 10. The Constitutional Club held a dinner here in honour of the birthday of George I (28 May 1715) and this sparked off two nights of rioting against the dissenters, who had supported his succession. A rumour spread that Queen Anne, Lord Bolingbroke, Ormonde and Sacheverell were to be burnt in effigy. Both town and gown attacked the members of the Constitutional Club and broke into the Presbyterian meeting house, setting its pulpit on fire. The following night (29 May) the Quaker meeting house behind Nos. 63 & 64 St Giles' Street (now the south part of Blackfriars and the north part of the Ioannou Centre) and the Baptist meeting place in Oxford were also attacked. 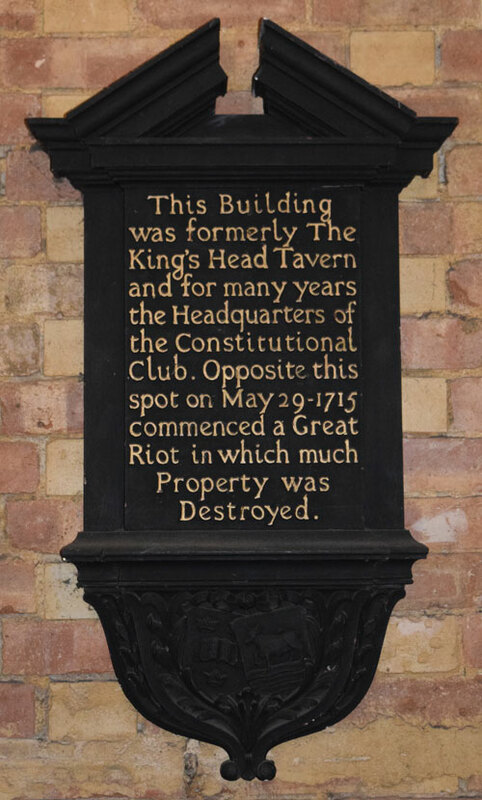 These riots of 1715 took place all over England, and led to the passing of the Riot Act. The government paid compensation to the Oxford victims, the largest amount (c.£109) going to the Presbyterians, and with it they were able to buy the site of what would later become New Road Baptist Chapel. The Baptists, however, had no home in Oxford until they joined the Presbyterians at their New Road Chapel in 1780, and the Quakers until they purchased the former Scottish Presbyterian church in Nelson Street in Jericho in 1888. In 1770 Nos. 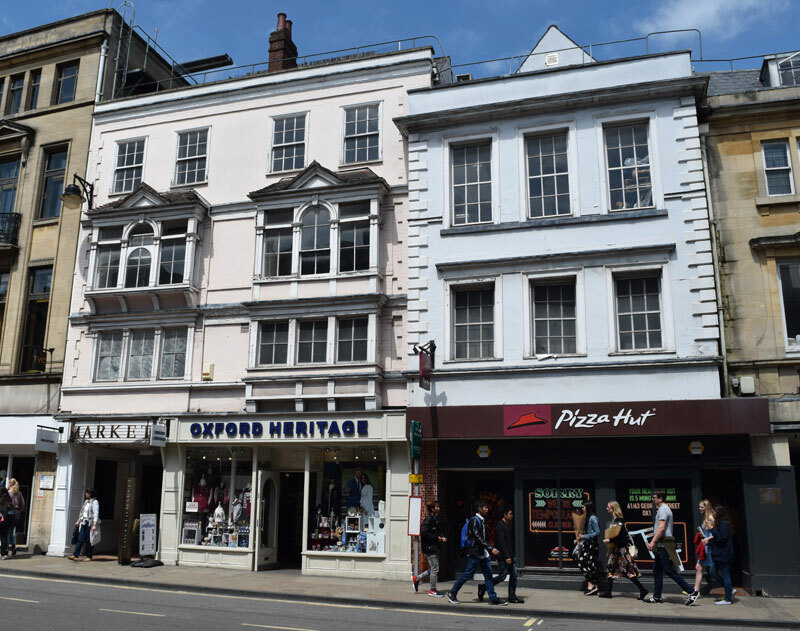 10 & 11 High Street were sold by James Darker of London for £375 to William Jackson, the proprietor of Jackson’s Oxford Journal. In 1771 Jackson also bought No. 12 from James Adams for £650, and used it as his printing house. On William Jackson’s death in 1794, his sister inherited Nos. 10–12 and immediately conveyed them to her brother's employee Miss Mary Jones, who had herself inherited from Jackson over 200 acres of land in Headington, including Headington House. On her death in 1815 she in turn left them to her niece and her husband, Elizabeth and Edward Latimer. In 1835 an Act of Parliament was passed for the enlarging of the Market on the west side, and under this Act the northern half of Edward Latimer's property at the back of 10, 11, and 12 High Street was acquired by the Paving Commissioners for £5,000. On 25 March 1875 the Revd William Latimer and others conveyed to the Vice-Chancellor and others Nos. 10–12 High Street for £8,300. The front portion facing the street was sold immediately to the City Drapery Stores. Nos. 10, 11, and 12, High-street, have come into the hands of the old-established firm of Messrs. Beaumont and Co., linen drapers and silk mercers, and very extensive alterations are being made by Mr. G. Jones, builder, under the direction of Mr. Codd. First, a new avenue [shown above, to the left of the pink building] is constructed to the Market, or rather to that part of the Market which is about to be added. The refreshment bar and wine business so long and so creditably conducted by the Latimer family will be approached from both the new avenue and the old one between Mr. Juggins's [No. 13] and the late Mr. Evans's premises [No. 12]. The shops Nos. 10 and 11 are being rebuilt; a large room about 35½ft. by 30½ft., for the sale of carpets, is being added to the already extensive show rooms of Messrs Beaumont and Co.; and other improvements are in progress. Initially in 1880 Beaumont & Co. ran the City Drapery Stores just in No. 12. Then In 1883 the linen draper Edward Beaumont junior who ran his shop at No. 9 next door extended into No. 10. The alterations at these premises (10, 11, and 12 High-street), which were commenced in the early part of the Long Vacation, are now completed. The old front which was inserted some thirty years back has been taken out, and a handsome modern one has taken its place, the centre pane of which, we believe, is the largest sheet of glass in the City. The thick wall at the east end of the premises has been pierced in two places, to make room for two large windows. The greatest addition, however, has been made by adding a new storey to the premises, by which a large room is available for the display of the numerous articles sold by this enterprising firm. This room is approached by a handsome staircase (copied as nearly as possible from the one in the drapery shop o[f] this establishment, which is so well known to antiquarians of the University and City) and has a floorage of 1000 square feet, and is 25 feet in height. A gallery, with an iron palisade, has been erected on three sides of the room, which is intended for storing reserve stock, &c. Two new rooms, devoted to bedsteads and bedding, have also been added: in the latter the original lantern light of Elden Hall has been carefully preserved. The alterations have been made under the able supervision of Mr. F. Codd, of Bocardo Chambers in this City, and have been carried out in a most satisfactory manner by Mr. F. H. Kingerlee, of Banbury and Oxford. Very important alterations have been made at the City Drapery Stores, 10, 11, and 12 High-street. The carpet and cabinet rooms have been considerably enlarged, so that each of them now have a floorage of 1200 superficial feet. A new room of large proportions has been fitted up exclusively for the lace and fancy goods, and another apartment is devoted entirely to body linen and ladies' underclothing. A handsome staircase (in the early decorative style of architecture) leading to the new premises has been erected on the ground floor, from designs supplied by A. Mardon Mowbray, Esq., F.R.I.B.A. The work has been executed in a highly satisfactory manner by Mr. T. H. Kingerlee, under the able superintendence of Mr. Watson. The proprietors of the City Drapery Stores have again taken advantage of the Long Vacation to make somewhat extensive alterations to their already large premises, and have also made a great improvement in their windows. In consequence of the rapid and continued increase of business, this enterprising firm has also adopted the Lamson Cash Railway, which is one of the most useful and clever inventions of our “cute cousins” across the “silver stream.” The “railway” may be briefly described as a series of elevated lines suspended from the ceiling, radiating from the cashier's desk to all parts of the shop, upstairs and down. There are two tracks in each line, one of which is inclined towards the cashier's desk, so as to convey the hollow balls containing the ash and bill tothe cashier; and the other, which is inclined in the opposite direction, returns the change and receipted bill to the customer. Beaumont & Co. were one of the first shops in Oxford to get a telephone line installed, and in 1895 they had the simple phone number 45. In 1905 Charles Webber bought Nos. 10–12 from Edward Beaumont. He soon acquired adjoining shops on both sides, so that in its heyday Webber’s had thirteen bays facing the High Street and included Market Avenues 1, 2, and 3. The firm was bought by Hide & Co. in 1952, and closed in October 1971. No one lived over these shops at the time of the 1911 census. The 1851 census shows Henry Ladd, the stationer, a single man of 26, living over his shop with a general servant. He was still there in 1861, but it was unoccupied in 1871. Edward Latimer ran his wine merchant’s business from No. 11 in the early nineteenth century, and “Latimer’s immortal tun” is praised in the poem Brasenose Ale. In 1835 an Act for enlarging the covered market on its west side was passed, so that the market now extends across the rear of these premises. A hole was punched through the western side of No. 10 to create a new entrance to the market (Market Avenue No. 1). The wine business at No. 11 was taken over by Edward Latimer’s son Frederic in the mid-1840s: he lived in Headington, and the 1851 census shows Robert Braine, a wine merchant who must have managed the business for him, living over the premises with his family. By 1861 the upstairs premises were occupied by Henry de Bariau, a teacher of languages, and his wife and son. The surgeon Thomas Tyerman lived upstairs in 1871. Samuel Evans, the draper at No. 12, lived over the shop at the time of the 1851 census with his wife and two young children. Also living upstairs were eight draper’s assistants, plus two servants. He was still here in 1861 with eight assistants. In 1871 his widow Jane Lavington Evans who was now running the business, was here with her daughter, three servants, and eight assistants.